The concept of space is an important one. Whether physical or mental, without space around the things that we perceive, think or feel, we lose sight of the complete picture. The glass that is always proverbially half-full or half-empty is actually always full; the air sitting in the water-free part is often overlooked. When someone is feeling depressed or struggling with their mental health, a feeling of space or distance can sometimes be helpful, as being too close to something is also not a great way to see the big picture. What has all of this got to do with playing American Truck Simulator? I’ll try to explain. 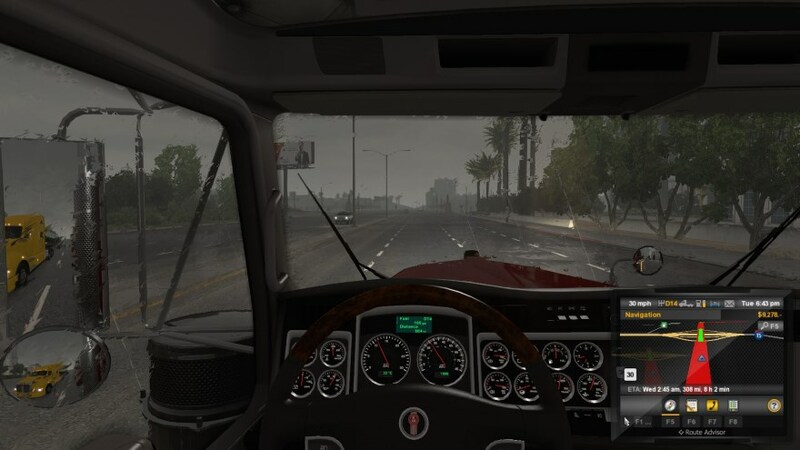 SCS Software’s American Truck Simulator is a game that puts the player behind the wheel of a truck, gives them a slice of America to travel through, and a list of possible jobs to take on. I know next to nothing about trucks, American or otherwise, and I have no desire to become a truck driver. I don’t even particularly like to travel, except in the realms of my imagination, or the occasional trip to the shops (Not sure if I’ve ever been to any imaginary shops). So why in the world do I find myself regularly driving a big rig in a game that, on the surface, I probably shouldn’t enjoy. The simple answer is space. The more complex answer is space, the correct mixture of tension and relaxation, and the minutiae of driving. Let’s start with space. Whether moving around in the real world, or some digital representation of it, the feeling of leaving home and going out into areas that you don’t control is a different mental experience to staying inside, surrounded by your own belongings. When we leave our homely surroundings, our thoughts will, to some degree, focus on where we are and what we are doing. I say to some degree because if you have a mental illness, a good proportion of your thoughts will still quite likely be ensnared in your awareness of self, or any of those worries and fears that seem to follow you around wherever you might go. 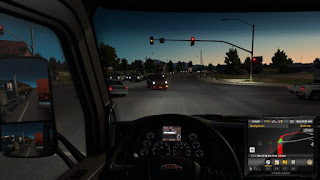 American Truck Simulator gives a fairly good impression of what it’s like when moving from one place to another, seeing a new town or city loom on the horizon as the old one fades in the rear-view mirror. This helps me feel a sense of space. Another way that the game serves up a dose of space is in its day and night cycle. Anyone that has spent too much time grappling with their own inner-states usually tends to lose the awareness that thoughts, moods and feelings come and go quite naturally, given enough space and time. Anger at the knock of the postman waking you up soon diminishes when he puts that parcel you’ve been waiting for in your hands. When you are trapped in your more upsetting moods and feelings, it’s easy to lose this sense of things ebbing and flowing (Practising mindfulness is very useful here, and is also quite useful in general). As far as ATS, driving along with the setting sun in your mirror, the sky ahead darkening and the cars driving past you lighting their way with headlights... it just gives a feeling of moving on, of things progressing. There is also something quite lovely about driving through the night and witnessing the sun begin to rise, the golden hues of everything giving eyes that are used to darkness and headlights something to feast on again. I personally find this invaluable when I’m at my lowest, and ATS serves up this feeling with a dependable regularity. Traffic and red lights at twilight. The next aspect that I want to talk about is the mixture of tension and relaxation. This concept seems integral to so much in life, whether it’s the contraction and relaxation of your heart beating comfortably in your chest, or your concentration being held firmly by a task for a duration of time before you let go and relax with a coffee-break. This seems to be the pattern for a well-balanced life well lived. Once again, if you suffer with anxiety, depression, or are undergoing a particularly trying time, your period of tension might stretch on and on, your body and mind hardening around the issues that brought it on, eventually leaving you unable to unwind or relax to any great degree. 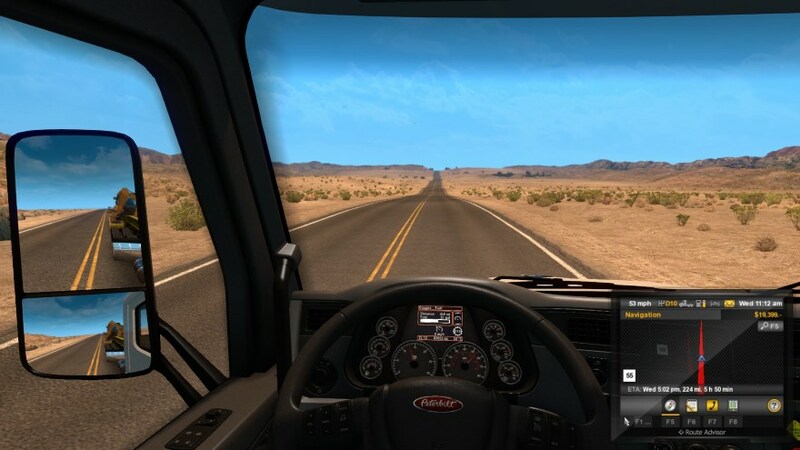 American Truck Simulator, by way of approximating the act of driving, provides a framework in which you can start to feel this tension/relaxation process, even if it’s only in the context of a game. Once felt in this more minor way, it sometimes leads to the loosening of other emotional or mental sticking points, as if the mind just needed a way to remember what letting go feels like. As an example, driving your truck through the desert on long, lonely roads is fine... for awhile. Just as you start to feel a little bored with it, you will likely come to a large city, somewhere where you need to be more “on your game”. The comfortably sparse roads are soon replaced with busy junctions, more road users and traffic lights. There will be many periods where you will be held up by red lights, queues and slow speed limits. Ah Las Vegas, what a pain in the arse you can be, with your many lanes and streets with traffic light after traffic light. Just as you begin to feel a bit annoyed, you are away, free, out in the wider countryside again, and can let go a little bit more. This is how the game provides tension and relaxation, and it is pretty low level, which is about right if you aren’t feeling your best. Other games provide tension and relaxation too of course, but trying to evade the Xenomorph in Alien: Isolation provides a far higher level of tension than accidentally bumping a pavement in ATS. Finally, we get to the minutiae of driving, which also straddles the tension and relaxation section above. 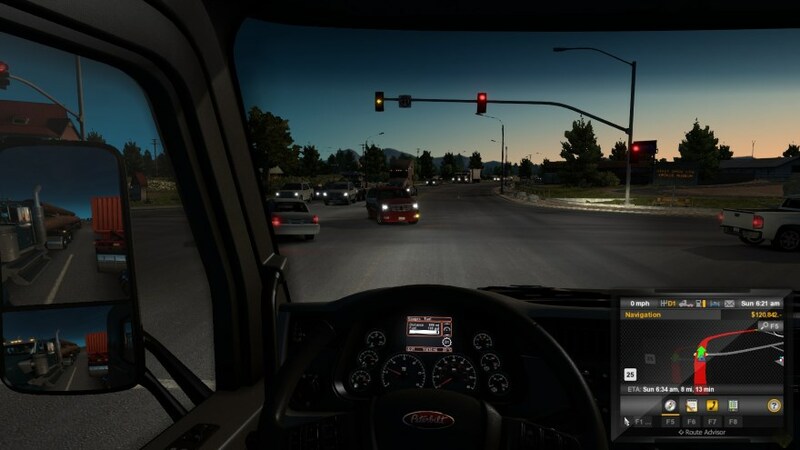 In American Truck Simulator, you have the rules of the U.S roads to follow, along with other actions that make driving... well, driving. In the course of your travels, you must obey speed-limits, indicate when changing lanes, use your headlights at night (and reduce high beams when other traffic approaches), and other things like turning your wipers on when it starts to rain. 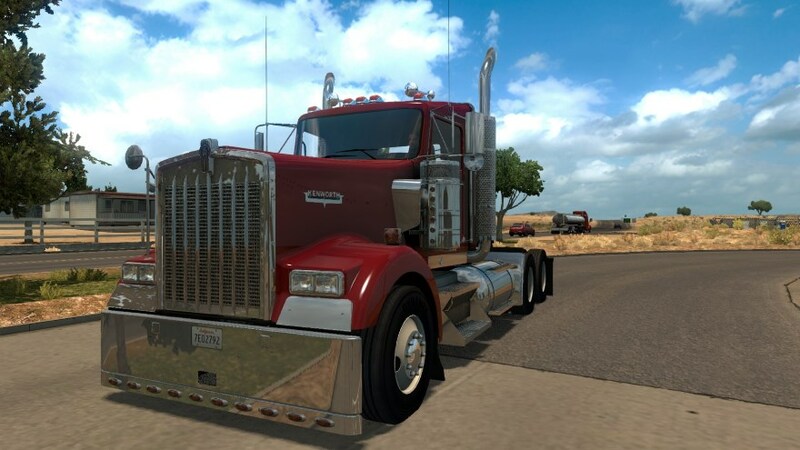 You also have the technicalities of managing your rest periods, fuel levels and how you can squeeze a long trailer around certain intersections without clipping anyone. To some people, this might sound like a pain, but to someone looking for gentle diversion, I find that there is just enough going on to keep my mind focussed on what I’m doing in the game, rather than having too much free time to ruminate or reflect too much on how I’m feeling. A counter to this, for me at least, is Candy Crush Saga. I’ve recently taken up playing it again on Facebook and it’s fine, as far as games like that go, but even though it’s puzzle based, I find myself with plenty of time to ruminate and feel like crap as I force the sweets to mate with each other and disappear in puffs of colour. No doubt it’s a very personal and subjective thing when it comes to how an individual game affects someone, but as far as keeping me gently attentive, ATS wins again. A nice drive by the beach. 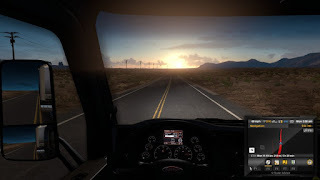 We’ve reached the end of my little ramble around the topic of why I think American Truck Simulator is my perfect depression game. You don’t need to be depressed to play it of course, but in the context of how I’ve been feeling lately, I just wanted to think about and share why it seems quite useful for me. I don’t mean to present it as a cure or treatment, but as one enjoyable tool that fills a gap for me when other games seem overwhelming, or my energy levels are low. A twenty minute digital delivery job that takes in some simulated scenery and maybe gives some experience of the day-night cycle is a pleasing buffer between what ails me and the stresses of the things I am trying to do in other areas of my life. If you like the sound of American Truck Simulator, be sure to check it out here. It’s only £14.99 too, so it shouldn’t break the bank. If you are suffering with any form of mental illness and have yet to seek help, please do, there are plenty of places out there that can and will help, from doctors to other organisations.